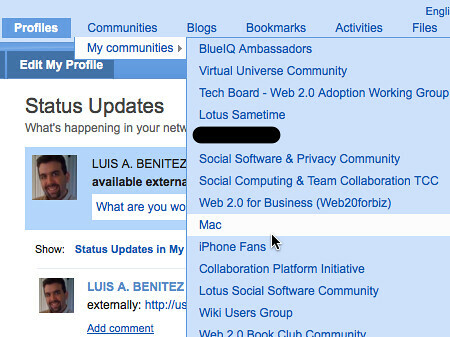 For some time now, we've had a plugin available internally that enhances the navigation experience within Lotus Connections. It actually requires Firefox, so if you are still using Internet Explorer, well, don't. It's an archaic browser and all it does is reduce your productivity. Ok back to topic. The developer of the plugin, Brett Johnson, has decided to make it available via userscripts.org. What does it do? Well, the plugin injects a drop-down menu in the top navigation bar. The menu 'discovers' what's behind those links and then dynamically presents you a sub-menu with available options. That way, if you know where you are going, you can get there in 1 click, instead of 3-4. I strongly recommend that you all download and install this plugin, but be aware that it may make Lotus Connections even more addictive. To download and install the plugin, go here. Updated 10/Oct/2009 - Note: As pointed out by Mitch: if you are using outside of IBM you need to change the scripts config from *ibm.com/profiles to *domainname/profiles etc. etc. for each feature.